Students rehearse for Imagine U’s upcoming performance of “Stellaluna.” The production, an adaptation of the book by Janell Cannon, is scheduled to run from Nov. 3 to Nov. 19 at the Wallis Theater. While parents and children may already know about the birds and the bees, Imagine U may just teach them a little something about the birds and the bats. 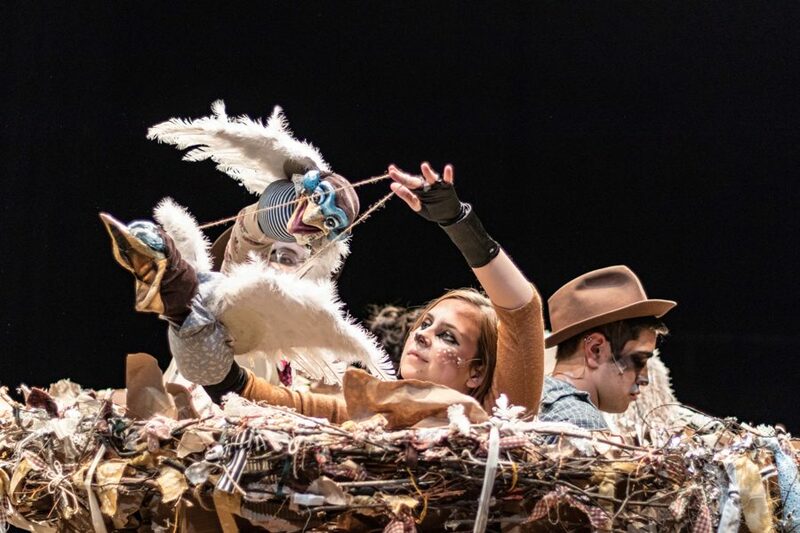 Northwestern’s Imagine U will answer that question in its upcoming performance of “Stellaluna,” a story about a baby bat who is forced away from the safety of her mother and finds herself among a new family of birds. Imagine U — a group specializing in productions for families with children — is kicking off the academic year with a series of “Stellaluna” shows. One of these performances will be “relaxed,” or designed to accommodate the needs of children with developmental differences. The production is an adaptation of the book by Janell Cannon and is scheduled to run from Nov. 3 to Nov. 19 at the Hal and Martha Hyer Wallis Theater. Third-year MFA in directing student Caitlin Lowans, the show’s director, said she believes the intersection of theater and storytelling is especially important for children. For the relaxed performance, Lowans said Imagine U worked with members of Seesaw Theatre to promote a safe and comfortable environment during the play for children with autism spectrum condition. Seesaw is a student-run educational organization on campus focused on making art and theater more accessible for children with developmental differences. Traditional theater productions often use lights, sounds and music to aid storytelling. While sudden changes in sounds and bright lights may excite neurotypical children, other children with autism or other cognitive or developmental differences may have adverse reactions, Lowans said. Imagine U’s education and engagement director Amy Nadal said she is responsible for ensuring the production team creates a secure space for all audience members by making any necessary changes to the performance. “(Before) there is a moment of stark change in sound or lighting, something that might be jarring, we would use (a) glow stick and wave it to the audience,” said Nadal, a Communication senior. Other modifications for “Stellaluna” include brighter house lights, the softening of loud instruments and the presence of a quiet room, where audience members can take a temporary break from the play if needed, Nadal said. Imagine U’s first relaxed performance was “Go, Dog. Go!” during Spring Quarter. Rostami said the show was well received by the Evanston community, especially by families with children who had special sensory needs. “Having parents say, ‘Hey, this is the first time we’ve felt welcome in a space like this and we had a great time,’ or to see children run on stage because they were enjoying the performance so much — those are the moments where I’m like, ‘Yeah!’” Rostami said. Despite NU’s recent efforts to improve theater inclusivity, Rostami said she believes there is still room for growth. Campus shows that cast students and faculty members could benefit from more disabled representation, she said. “It’s really exciting to be at the forefront of the field, to be able to have experiences that other universities are not offering,” Rostami said.